A lot of our game purchases these days are mostly tied to game lines, styles or even creators that we have come to like. It's a relatively safer way of buying games and one that risks relative homogenization of our collection, admittedly. So how did we end up with a game like Unearth? Every now and then a game comes along because of ineresting packaging design or even just because of its title. It's enough to pique one's curiosity to the point of taking the game off the store shelf and looking into it further. And sometimes you get some surprising winners. 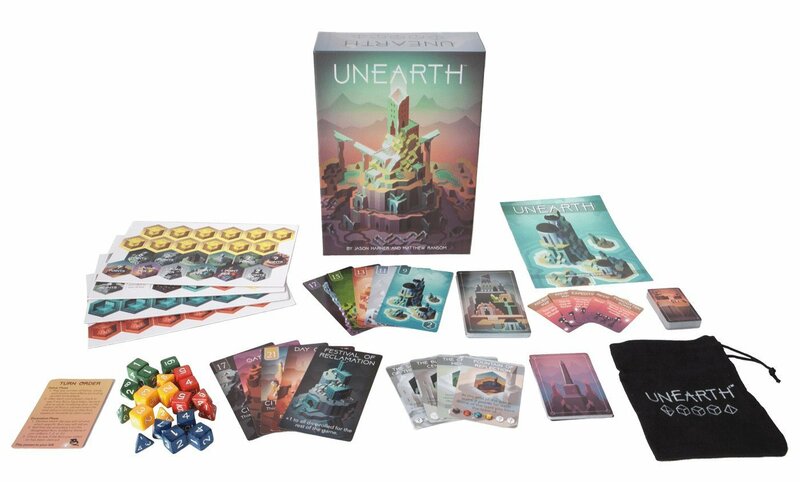 Unearth is a card game with a strong dice element created by Jason Harner and Matthew Ransom. The game supports 2-4 players and plays out relatively quickly as far as games go. Players represent different tribes emerging from the safety of their caverns to explore ancient cities from well before your time. Your tribe of Delvers is represented by your dice - 1d4, 3d6 and 1d8. High rolls give you a better chance of claiming a ruin for your tribe. Lower rolls (1-3) help players gather Stones, which can give you access to Wonders. This gives you multiple paths to victory such that any die roll can still have value. What helps players get what they need are various Delver cards that can manipulate your die values (but never beyond numbers on the dice themselves). Do you focus solely on your secret color of Ruin? Do you make the most of lower rolls with Stones? Do you try to gather different colors of Ruins for bonus points? It's up to you and your tribe to decide. What I Liked: The art style that drives the game seems simple at first but it's actually quite elegantly beautiful. There's obviously a strong gemoetric component to this game given the hexagon-shaped Stones and how you build the right shapes to pull in Wonders to your side. And seeing that geometric sense reinforced by the Wonders and the Ruin designs was quite a lovely addition to this game. As much as we don't quite like dice-based games, the system that drives Unearth is vey well thought-out and makes sure that your rolls are almost always useful. Tie in the decision to have different types of dice that can help you focus on gathering Ruins or gathering Stones based on their values was a very good idea. What Could Have Been Better: The Delver cards are sort of an important part of the game but then theres that feeling that there aren't enough variants to make it truly worthwhile. They can help but they don't necessarily feel like a truly critical part of winning the game given there are so many avenues for success. Similarly the cards that mark the end of the game don't seem that essential either - like a last-minute idea tacked onto the game for the heck of it. The other challenge is the game mecanic that involves setting a side a number of Ruin cards at the start of the game. While it does add a degree of diversity since it changes up the possible cards you can get. But then it can also set players back when the Ruins set aside are mostly if not all of one color that matches someone's secret Ruin, then their chances of scoring higher diminish significantly. And that's a wonky mechanic just for the sake of changing up the cards every time. TL;DR: Unearth is a well thought-out game that's not too hard to learn and presents a different experience every time. It's highly visually appealing and it's one of the less frustrating push your like dice games and that keeps things fun. Thus the game gets a good 4 colorful Ruins out of a possible 5.